planning in full swing. Spring brings the promise of a great and successful banquet season. Larsen, from the Grand Rapids Chapter. initiated, and underway in our state. funds have enhanced ruffed grouse and woodcock habitat on over 79,000 acres of public land. work conducted on private lands in Michigan. used by ruffed grouse during brood rearing and by woodcock as singing and roosting areas. promote dense cover for these species across the Gogebic County Forest. improvements to access roads and trails and alder regeneration. Forest Service, therefore doubling on the ground management activities. Shreds small trees and brush into a coarse mulch. How big a tree will it take down? 12”) trees but it takes longer to turn them into mulch. Non RGS members $125.00/tachometer hour. Hourly fee includes operator and fuel. Can I operate the ASV myself? provided by RGS will be much more productive than an occasional operator. How much will the ASV do in an hour? conditions were excellent, we have done as much as an acre per hour. How do I schedule the ASV to work on my property? See the RGS/ASV promotion sheet for how to contact John Paige or Gary Zimmer. (Lansing) Chapter and donated to the MDNRE and in use in the Rose Lake State Game Area. implementing programs and assisting chapters in need. Please contact me for more information. The following is the tentative schedule for banquets, dog trials, shoots, and habitat days for 2010. 2010 after a year off. Gift Certificate. And, just as in past years, about 70-percent of those eligible entered the drawing. includes (along with various other incentives) 1, 2 and 4 tickets respectively. box-lock, 28 gauge shotgun, valued at $3,650. side 20 gauge shotgun, valued at $2,380. gauge with 26 -or 28-inch barrels, valued at $2,395. • Mark Zwiker, Wausau, WI, choice of Steiner binoculars, valued up to $1,600. • Ross Rackliff, Medway, MA, $1,000 Cabela’s gift certificate. be assigned a ticket number(s) for the drawing by RGS National. 2. AYA 453 – 28 Gauge, 28” Barrels, Side-By-Side; Walnut Stock & Forend. 3. Caesar Guerini Magnus Over/Under 20 Gauge Shotgun. 7. $1,000 Cabela’s Gift Certificate. limited edition of 600. Print size is 19.5” x 17.25” and the image size is 16.5” x 13.25”. project in Haywood County, NC. plant and animal species, and law enforcement needs. Senior Regional Wildlife Biologist Mark Banker. benefit grouse, deer, rabbit, small mammals, and various species of songbirds. The Equipment is Coming, The Equipment is Coming!! The Ruffed Grouse Society (RGS) recently received three grants totaling $182,000 to purchase heavy equipment for managing habitat in the Upper Midwest. RGS has purchased two ASV/Terex PT-100 Forestry loaders (similar to the machine shown above) with mulching heads with grants of from the R.K. Mellon Foundation, the Frey Foundation of Grand Rapids, MI, and the Charlevoix County Community Foundation located in East Jordan, MI. The new pieces of equipment will service Michigan and Wisconsin as well as surrounding states. 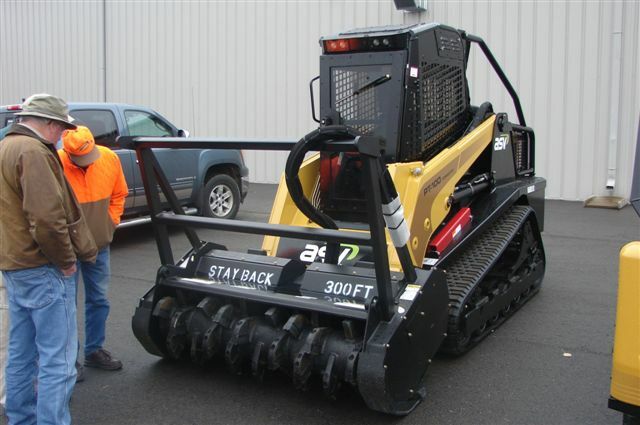 The versatile equipment will allow the RGS to help public and private partners aggressively manage neglected aspen, alder and brush habitats for ruffed grouse, woodcock and many other species. The RGS and its partners have been operating similar equipment in the Northeast for several years with excellent results. The equipment program has allowed the Society and its partners to manage high quality habitats that typically are neglected because of the lack of proper equipment. Woodcock in particular have benefitted because large areas of old fields, prime woodcock habitat, that are typically left to convert to forests are now maintained as shrublands. “We are extremely grateful to our funding partners who have allowed us to grow this program”, stated RGS Executive Director and CEO Mike Zagata. “These machines will help us manage critical habitat on public and private lands in two crucial states”. You Missed Out! 0 Days Left! Thanks to all who have purchased a national raffle ticket so far. If you haven't, please enter soon or you might miss out on a upland game bird hunting trip of a lifetime. First Place Prize - All Expense Paid Trip for Two to hunt from October 3-5, 2009 for sharptail grouse and Hungarian partridge at Bear paw Mountain Outfitters in Havre, Montana followed by participation in the National Grouse and Woodcock Hunt in grand Rapids, Minnesota from October 6-9. Both hunters also receive an SKB model 1785 o/u shotgun. Approximate value of package: $18,000. Third Place Prize - Custom fitted Pair of upland hunting boots from Russell Moccasin Co. Approximate value of boots: $400. Donation for Tickets is $50 each with winners drawn on June 30, 2009. Landowners in Northeast Iowa have a unique opportunity to reverse the downward population trend of Ruffed Grouse, Woodcock, and many types of migrating songbirds. The United States Department of Agriculture (USDA) is offering a new Continuous Conservation Reserve Program (CCRP) targeted at Early Successional Forest Species such as Ruffed Grouse. The State Acres for Wildlife Enhancement (SAFE), or Early Successional Habitat program, is meant to develop CRP habitat on marginal crop ground that will provide specific food, nesting and cover needs required by numerous bird species that are showing nationwide decline. Early successional forest habitat is a very young forest, or edge habitat, characterized by a dense growth of saplings and shrubs. Periodic cutting is necessary to maintain this type of habitat. Aspen stands, for example, will die out if they aren’t cut every 15 to 20 years. Oak and Aspen are the preferred tree species for this practice. The oak will be left to grow to maturity to provide food for many species of wildlife, and the aspen will be cut to maintain dense, early successional growth for grouse and songbirds. Shrubs and a narrow grass buffer can also be implemented to maximize sunlight and nutrients next to existing crop ground. Early Successional SAFE has many of the bonuses that other Continuous CRP programs offer, including a Signup Incentive Payment of $100 an acre, up to 90% cost share to establish the desired habitat, and an annual rental payment for 10 or 15 years. There is no Highly Erodible Land index requirement or a maximum amount for acres offered in Early Successional SAFE. Producers in Allamakee, Clayton, Fayette and Winneshiek counties in Iowa can submit offers to enroll cropland acres for 10 to 15 years. To be eligible for this signup, land must meet basic CRP eligibility requirements. CRP rental rates increased in October, 2008. For more information, contact Greg Schmitt at 563-422-6201, your district forester, or your local FSA office. Judgements in favor of the US Forest Service were recently received on two vegetation management projects on the Chequamegon/Nicolet National Forest in Northern Wisconsin. On January 12th, District Court Judge Lynn Adelman of the Eastern District Court ruled that the Forest Service had adequately addressed cumulative effects in the Twentymile Project on the Great Divide Ranger District. This project includes over 9,000 acres of vegetative management. The plaintiffs in the case were the Habitat Education Center out of Madison, WI and the Environmental Law and Policy Center from Chicago. They claimed that the Forest Service failed to properly consider the effects of the project on forest species like the American Pine Marten, Northern Goshawk, and the Red-shouldered Hawk. On March 19th, the same judge also ruled in favor of the Forest Service on similar grounds on the Fishbone Project, on the Washburn Ranger District. This project would impact approximately 5,000 acres within a 22,000 acre project area. These decisions are good news for finally moving the implementation of the 2004 Forest Plan along but on March 13th the plaintiffs appealed the ruling in the Twentymile Project to the 7th Circuit Court of Appeals and have asked for a stay in awarding any timber sales in the area. Building on its success, the Wisconsin Coverts Project will be expanding to two workshops in 2009. The traditional Wisconsin workshop for private forest landowners will be held August 13 - 16 at Kemp Natural Resources Station near Woodruff, WI. A second workshop targeting absentee landowners who own land in Wisconsin, but reside in Illinois is being supported by the T. Stanton Armour Chicagoland RGS Chapter. This workshop will be held at the Max McGraw Wildlife Foundation in Dundee, IL from August 27 - 30. These 3-day sessions have had rave reviews from past attendees that have become Covert Cooperators through past workshops. Now starting its 16th year, 374 cooperators have attended these workshops. Sharing with others what they have learned these Coverts Cooperatorshave influenced the management of over 434,000 acres of land in Wisconsin. This workshop is highly recommended for those landowners interested in better understanding their role as stewards of their property. For additional information on the workshop contact Jamie Nack at 608-265-8264 or by email at jlnack@wisc.edu . Attendance is limited. More information is available on the Coverts Project website at http://forestandwildlifeecology.wisc.edu/wl_extension/wicovertsproject.html . Deadline for applications is June 15th. The Mid-Missouri Chapter of the Ruffed Grouse Society and the Missouri Department of Conservation are once again sponsoring a Forest Management Workshop for Private Landowners on Saturday, April 18th on the Bill Haag property near Portland. Starting at 9 AM, the workshop will include forestry and wildlife specialists discussing tree identification, cost share opportunities, forest and wildlife management, and timber harvest methods. An optional dawn tour to listen for drumming grouse is also available. For information call Josh Stevens at 573-592-1400, ext. 4. The Michigan Society of American Foresters has put together a publication of forest management guidelines for both professional foresters and landowners to assist in the management of our forest resource. The forest management guidelines recognize the renewable nature of forests and the influence of forest management practices on the many uses of the forest including water, recreation, wildlife, timber, and aesthetics. Because of the diversity of forest conditions, values, and ownerships, no set of management guidelines can cover all situations. Professional and landowner judgment must combine scientific knowledge with these guidelines to determine management practices for a particular property. The goal of these guidelines is to provide for conservation and stewardship of all forest lands in Michigan. The Michigan Society of American foresters challenges landowners, forest managers, forest industries, and timber harvesting contractors to follow these guidelines. They provide a common sense approach to better manage the forest lands of the state. This publication can be found at: http://michigansaf.org/Business/MSAFguide/MainPage.htm . April 18 - Missouri Forest Management Workshop for Private Landowners near Portland, MO. Contact Josh Stevens at 573-592-1400, ext. 4 for more info. April 20 - Wildlife Habitat in Early Successional Forests Workshop at Michigan Technological University in the U.J. Noblet Forestry Building, Houghton, MI. Contact Michael Rose at 906-281-0899 for info. April 25 - Intro to the Outdoors Youth Education Day near Marshfield, WI, sponsored by the West Central Wisconsin RGS Chapter. Contact Rich Chronquist at 715-387-1163 for info. April 25 - Habitat Work Day on the Oconto Co. Forest near Breed, WI. Contact Dave Bartz at 920-743-6004 for info. May 16 – Habitat Work Day on the Eagle River/Florence District of the Cheq/Nicolet National Forest . Contact Dave Bartz at 920-743-6004 for info. June 15 - Sign Up Deadline for WI Coverts Workshops, Contact Jamie Nack at 608-265-8264 or email at jlnack@wisc.edu . June 20 – Habitat Work Day on the Cheq/Nicolet National Forest near Laona, WI. Contact Dave Bartz at 920-743-6004 for info. August 13 to16 - WI Coverts Workshop, Contact Jamie Nack at 608-265-8264 or email at jlnack@wisc.edu . August 27 to 30 - WI Coverts Workshop in Illinois, Contact Jamie Nack at 608-265-8264 or email at jlnack@wisc.edu . 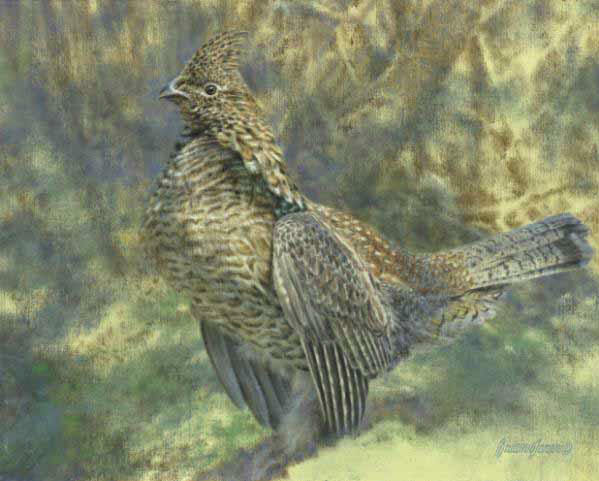 The Ruffed Grouse Society is the one international wildlife conservation organization dedicated to promoting conditions suitable for ruffed grouse, American woodcock and related wildlife to sustain our sport hunting tradition and outdoor heritage. For information on the Ruffed Grouse Society, please call 888-564-6747 or check out the RGS website at www.ruffedgrousesociety.org . Happy New Year Fellow RGS Members, I want to take this opportunity to thank each and every one of you for your continued support of the Le Grande Chapter of the Ruffed Grouse Society. Best wishes to everyone for a happy, healthy New Year, canine and human alike. WOW what a year, through your generous support of our chapter we experienced significant growth in 2008, helping to raise funds and promote the Ruffed Grouse Society’s mission. I would be remiss to not thank each of the committee members for their hard work and dedication to the Chapter it is much appreciated. Also I would like to recognize our community business partners, sponsors, and members for their generous donations and financial contributions in 2008, specifically with the banquet. In 2008 we experienced a 29% increase in attendance at our Annual Banquet. Held two days before opening day of Grouse Season, 181 folks gathered at the Great Wolf Lodge for fun, food, and bidding. Hugh MacMaster was the recipient of the 2nd Annual Ray Bunn Sportsman of the Year Award. Paul Fischer was recognized for over 10 years of volunteer commitment to the chapters committee! A few highlights from 2008 include a great dog trial that saw 60 different dogs, 9 different breeds, and 41 different dog handlers converged on Thundering Aspens Shooting Preserve in Mesick, MI. We had three divisions featuring Pointing, Flushing, and a puppy class. Total attendance for the event was pushing 80 RGS members and guests! Speaking of Paul Fischer, congratulations to Paul and his wonderful Pointer “Rip” for winning the 08 MI RGS Gun Dog of the Year title. Each year the chapter works to analyze what we can do to not only raise funds for the RGS, but to also build a community organization that creates camaraderie for its members. We are pleased to announce that for the third year in a row the banquet will be held on a Saturday night. We will have a new location this year and expect to see everyone at the Williamsburg Dinner Theater on September 12, 2009! Also new this year will be four dog training nights starting in May. These nights are designed to gather members together and help train our Grouse dogs. They will be held on licensed dog training grounds, and birds should be available for sale at the grounds that night. The idea is to gather a wealth of knowledge and offer assistance and pooling of equipment. Training in a group is not only fun but also a great way to learn from each other. Dogs are central to our member activities, after great success and feedback about the expansion of our annual fun hunt, we will once again be going forward with three divisions at the May Fun Trial; Pointing, Flushing and Puppy divisions will be run. With the top 4 dogs from each open division qualifying for the GDOY trial. If you have never attended or participated in one of these events, please join us for all finds of fun. We are always looking for qualified Judges for this event, if you are interested in judging please contact Fritz Heller at 231-590-0864.